Whoppi Goldberg is one of those types of personality who is known for saying it “like it is”. Why not? With the fixed water of her Scorpio Sun and Moon, she has no fear in expressing her beliefs and feelings. In her Sun’s self-projections and her Moon’s emotional reactions, Goldberg expresses two types of personality—both as a Scorpion and as an Eagle. When Whoppi’s eyes take on an intense “hypnotic laser focus”, you know the Scorpion is searching the darker corners, to find a hidden resource or object of need. Once the treasure is spotted, these piercing eyes lift up on the sides, as the arms pull back like wings. With their sequential liquid flaps, these feathered wings send the Eagle soaring off into the heavens—to find a “grander place to perch. With her Sun in the 9th house (conjunct Saturn), Whoppi uses comedy to expose reality’s dirty laundry. With controlled doses of “Scorpion venom”, she exposes the stupidity and arrogance of others. For many, this revealing of secrets proves relieving! Whoppi Goldberg doesn’t just entertain her audiences—she transforms them! With the addition of another component (in another sign), there is the potential to create all types of personality. So it is with Whoppi, who has Aquarius as her Rising Sign. This Aquarius adds a touch of lightness and friendliness to her intense Scorpio personality. Like the Phoenix, Whoppi Goldberg often rises above the ashes. Watch Whoppi in conversation on the TV show The View, and you may notice that she always seems to connect with her audience when she defending her altruistic social views. This can be attributed to her Aquarius Ascendant and Jupiter conjunction to her Sun’s ruling planet Pluto (in the Seventh House). With these Jupiter aspects, Goldberg often has an instantaneous urge to bring Scorpio’s secrets out into the open—for all of humanity to use. With this Ascendant, Whoppi has a type of personality that is an intuitive/psychic mix of Scorpio and Aquarius. The ascending mask out front gives her an erratic and electric persona. In the movie Ghost, you may recall how her face light up and her eyes widened and sparkled, when she became “amazed” by the voices and visions that she picked up from the other side. 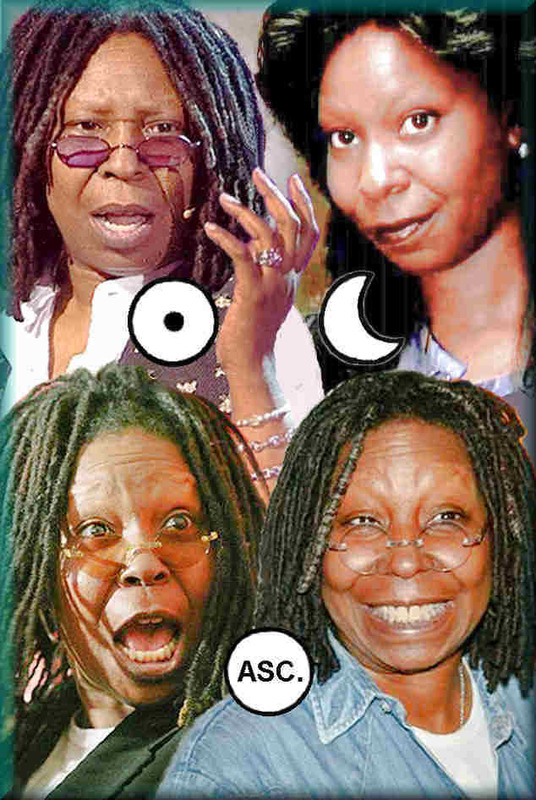 Like Roseanne Barr, Whoppi is a Scorpio Sun with Aquarius rising. Both appear rebellious and unconcerned about their public image. They say what they think, and they often dress in a bizarre and outrageous manner. For these Aquarius Ascendants, appearances don’t matter. Rather, in their hearts, these Scorpios know what really counts are the actions that you take in life.